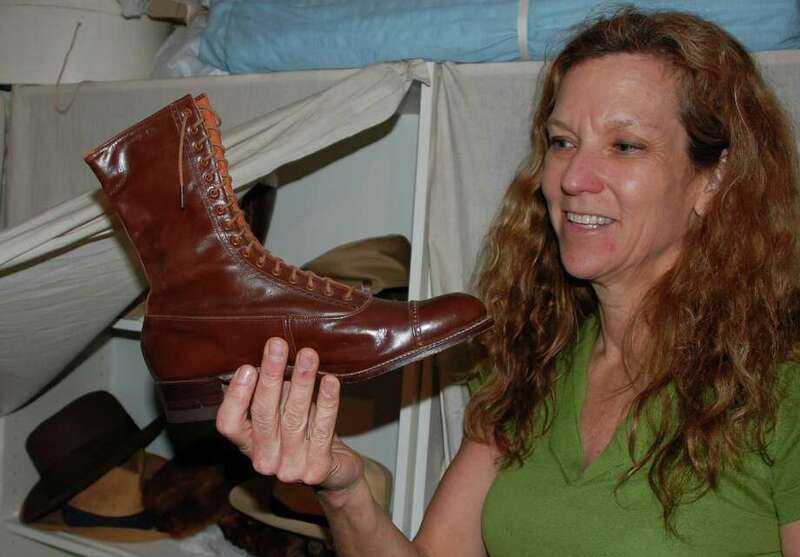 Elizabeth DeVoll, education director at the Westport Historical Society, inspects historic footwear in the institution's collection. After hosting numerous exhibits that celebrate the town's history, the Westport Historical Society is putting itself in the spotlight -- opening its expansive archives and dusting off its extensive collections -- for the new exhibit, "Treasures Revealed! The WHS Archives and Collections." "We just thought we would expose and do an (exhibit) on our wonderful historical society, because I think it can be very much overlooked," said Susan Wynkoop, president of the historical society. Hundreds of historic items have been collected from throughout the Bradley-Wheeler House headquarters -- from the basement vault up to the antiques-filled attic. Visitors to the exhibit, opening Sunday with a companion display, "Inside Story," will see a treasure-trove of local history -- everything from Kewpie dolls to antique toasters to historic documents. "We have a lot of collections that aren't shown," said Barbara Van Orden, the historical society's director of collections. She said the most satisfying aspect of displaying the "Treasures Revealed!" artifacts are that they bring back rich memories for many people -- "the memories of your life." Meanwhile, "Inside Story" chronicles the history of the Bradley-Wheeler House and adjacent cobblestone barn, beginning with its 1795 origins through present day. Among the long-lost artifacts seeing the light of day again in the exhibit is the needlepoint depiction of the Bradley-Wheeler house by actress Joanne Woodward, a Westport resident and longtime historical society supporter ,who in 1981 led the fundraising campaign that enabled the society to purchase the house from Christ & Holy Trinity Episcopal Church for $300,000. Among the featured artifacts on display are documents from Westport's early history, correspondence and photos, vintage clothing, U.S. Coastal surveys and aerial maps showing Westport from 1838 to 1931, Mary Sherwood's early-19th century wedding quilt and an 1874 inkwell carved from a Bedford Estate chestnut tree. Besides the collections, visitors can watch video tours of the headquarters property, as well as gain access to the hidden rooms where some of the most valuable treasures and long-forgotten memorabilia are stored. "Our landmark Bradley-Wheeler House and cobblestone barn and the artifacts in our Victorian period rooms ... are only the tip of the iceberg," said Susan Gold, the historical society's executive director. "Once Westport realizes what our archives, collections and buildings contain, the more they will be visited and used," she said. The exhibits open with a reception Sunday from 3 to 5 p.m. at the Bradley-Wheeler House, 25 Avery Place, and run through April 27. For information, call 203-222-1424 or visit http://westporthistory.org.